In November of 2011, a team from Nemours Alfred I. duPont Hospital for Children came to see patients at the clinic suffering from hearing loss. 3 years later, we have worked together to help over 60 families and have published two peer-reviewed scientific papers, including a novel hearing loss gene. 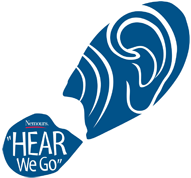 This year, Nemours’ annual “Hear We Go” 5K raised over $20,000 for hearing research, family education, and much needed equipment. To help the clinic, Dr. O’Reilly and the team from Nemours have donated funds to supply the clinic with state of the art audiologic testing and hearing aid dispensing equipment. Patients at the clinic now come for regular check-ups with our doctors and then walk down the hall to visit a team of sub-specialists like Drs. O’Reilly and Morlet. Collaboration and sub-specialty integration have become the key ingredients to solving complex problems for our patients. From early hearing interventions like digital hearing aids and cochlear implants to the discovery of novel hearing loss genes – our clinical care continues to drive research, and our research leads to better outcomes for children. We are grateful for the generous support and collaborative spirit from our friends at Nemours, and we look forward to many more successful translational research projects to come! Thank you for a Record Auction Season!